In this episode, Harold Reitman, M.D. speaks with Colin Eldred-Cohen. He is the author of “The Fire Truck Who Got Lost,” a movie reviewer, and a young man on the autism spectrum. 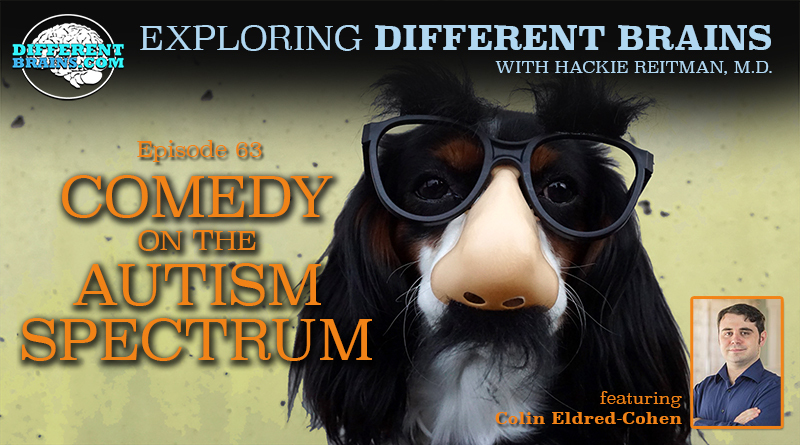 Colin discusses his diagnosis of Asperger’s syndrome, the importance of harnessing hyper-interests, and his love of comedy. He also discusses his involvement in the Autism Creatives Collective– a community of talented creative writers, artists, and musicians on the spectrum, begun at a meeting of our good friends at AASCEND. 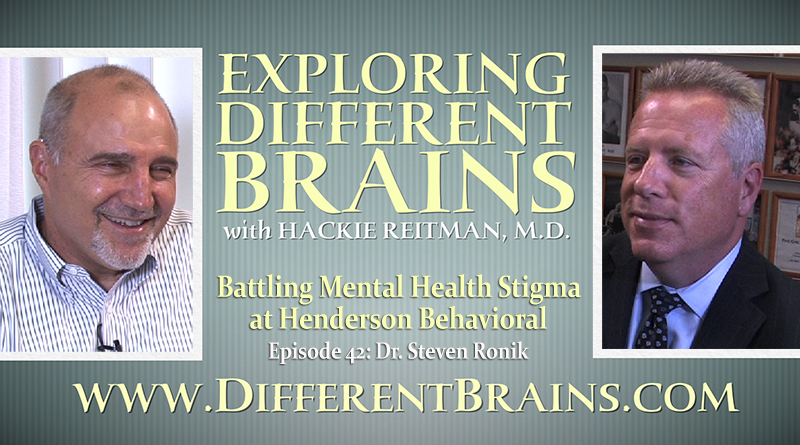 I’m Dr. Hackie Reitman welcome to another episode of exploring different brains. Today we have as our guest Colin Eldred-Cohen from the California area, and Colin has just written his first book, but more importantly he does a lot of stuff at fishandcherries.com. He’s going to tell you all about it. Colin welcome to Exploring Different Brains. Hackie thanks for having me on Different Brains. Well, he pretty much said It. I’m a writer, I do reviews of Comics, books, and movies and I just came out with my other book “the fire truck we got lost.” If you want to see more go to fishandcherries.com, the official mission cherries production page on facebook or follow me on twitter at @cecronin. How did you first decided to become a writer? I honestly don’t know if I ever decided. I think it was just always there. I always was i’ve been writing since preschool, just not all of it very good. What are your other hyper interests would you say? How did you figure out your on the spectrum? My parents figured it out. I just kind of always knew. It’s just been something that was constant about me, that always told me i had Asperger’s syndrome, and well kind of grew up knowing that. So i guess you could say I was diagnosed very early on. How did your upbringing differ from say somebody who might be considered neurotypical- which by the way I don’t think really exist but- what were some of the early interventions you recall? Well um… so in school I had had to take my tests in a different room because I needed more time. That was most of the stuff in school. Early on I had to go to speech therapy, and in college I needed a note-taker too because, well, college professors moved a little too fast. Now my daughter Rebecca who’s 34 and she got her discrete mathematics degree from Georgia Tech now she’s spent a third of the way through a master’s in applied psychology- she’s not bashful anymore about going to the office of disabilities asking for some of the accommodations you just mentioned. But I find that a lot of people are reluctant for instance. Some of our interns who pass through here who might be on the spectrum I have Asperger’s or you name it and they go off to college and they don’t want to be stigmatized. They don’t want to they don’t want to ask for the accommodations. What advice would you have for people entering college? There is nothing to be ashamed of like there is no such thing as normal. If you need someone that you take notes or some extra time on tests or whatever it’s perfectly fine. You probably excel in the whole different areas. Tell us about your experience at the San Diego School for Creative and Performing Arts. Do you consider yourself a comedy writer? Do you consider yourself a comedy performer? What are your favorite comedy movies? I want to see if our senses of humor are similar- probably not. Alright well if I had to pick I would… I would say at least in the early days Charlie Chaplin, but I’m going a bit more modern I gotta say it’s a cross between Mel Brooks and Monty Python. I have a chapter in my Aspertools book about how important it is to harness the hyper interests, some would call obsessions right. I tell everybody no matter what their brains like if you can if you’re lucky enough to find out what you really love and you can figure out how to make a living at it and if what you do also can help or make happy other people that’s the perfect trifecta you have a good time the rest of your life and you never working. Have you figured out how to monetize your hyper interests? I’m still working on that at the moment. I’m using my writing hyper interest to build up the resume. On top of my fish and cherries thing i’m also doing some unpaid gigs for fan-base press where I write reviews for comics that haven’t come out. Every review is one more notch on the resume, but it’s also something I really love to do. How did you get involved with AASCEND? Ah yes we just call it AASCEND here, but i gotta thank my have parents for that, or at least my dad, but i think my mom was too… basically they were looking around, they found this group, and they thought “that’s interesting, there’s a community of people on the spectrum up in the bay area.” So I tagged along with them, sort of got integrated into the group, and i’ve been going to a few meetings ever since. And my dad, Donald Cohen, is helping make what he calls the “autism creative collective”- sort about networking group for creatives on the spectrum. So for all our creatives on the spectrum who might be watching you or listening to you now, how do they find out more and how do they get in touch with and what do they do? Think at the very least you can get in touch with Donald Cohen my father at Donald@inthepublicinterest.org. Other than that I just say Google autism creative collective and see where that gets ya. That is some crew out at AASCEND, I had the pleasure of speaking out there recently. That was some crew out there- Michael Bernick and all the rest of the happy campers there. And your dad does a lot of great work tell us more about in the public interest if you if you might comment on your dad’s role there. Ah yes my dad’s role at in the public interest- and that is a thing I know. Um well as far as role he’s the owner so that’s something, and as far as what he does he flies out to Washington every week or so. I feel like does nonprofit work… i know i am part of the email blast so I get political emails from them. Okay should we can go to their website and figure out what they’re doing. Yes that sounds like a great idea. Yeah, certainly think so we. Sold 34 at least 35 copies this weekend alone it’s mind-blowing. That’s great. What is it about? Tell us about the book. Well it’s about a young fire truck named Barnabas, and he lives in fire station 12 with for larger fire trucks and big Dalmatian. And he gets to go fight his first fire, the trucks are there to help him. Trucks are doing stuff, his hose is too little and he tries to go find some water to help him. Then the fire goes out and the trucks leave. So when Barnabas comes back he has to find a way to get back home, because the trucks accidentally left him. Where can people purchase that book? Are you purchase it on amazon or the art of autism. What would you say your career goals are? My career goals are to make fish and cherries productions a legitimate internet studio that’s producing video content, audio content- basically like an actual production studio. Ok what is your role at fish and cherries- you’re the chief cook, and bottle washer, and do everything? You shoot you edit? And your skillsets- you have a ba in filmmaking? And where did you get that from? In Santa Cruz. How are your editing skills would you say? Um I mean I learned it a long time ago, and sometimes I can get hung up on making all the shots flow perfectly together. I would say I’m pretty good though I am sure there are other people out there who can do what I do super fast now. How much time do you spend writing in the day would you say or is that very variable? It’s variable though I’d say a minimum of five hours. What about your video shooting skillsets? Film shooting I’m about uh i would say I’m about a 7 too. My biggest trouble is lighting and sound design, and i’m not even sure if I’m a good director like able to communicate things two actors very well. But I would love to, if not get better, than find some people who are better to work with on. How did you gravitate toward comedy? That’s a good question. Well part of it is that i really like laughing. But another thing is that’s the easiest way to judge if someone likes your movie. That’s kind of what i discovered in college. So yeah I just kinda started… yeah it’s hard to say because i’ve always had comedy in mind, but I don’t know I just always wanted to give people that same sort of pleasure that I get when I sit down in front of a good comedy. Was your family supportive in this? What advice would you have for young person… how old are you by the way? So let’s say I’m now early twenties i’m watching this what’s the biggest advice you have for me? Say I’m twenty-some-odd years old i’m on the spectrum i haven’t quite found my niche yet… what’s the overall advice you would have for me? I would say it keep trying, find something you really love and go for it, and find a good support network of friends or family or mix. Because, weather you know whether or not they will be helping you- or whether they know it or not. Sometimes just you’re with friends and that’s when the best of you comes out. That’s what I found. What advice would you have for any of the parents watching this? Um any of the parents with the non-neurotypical children? I would say your child is at a stage in his life where he really needs love and support. The world is can be very unforgiving for non-neurotypical people. So always listen to what’s going on with them, also always try and find some way to help, and always ask questions because that’s the best way you’ll be able to understand. What are some of the favorite clips that you’ve done that people can find either on youtube or on fishandcherries.com? What are some of your favorite bits that have you on camera? Uber, uber. It’s an ad for Uber is what it is. Zombies, they like taking Uber particularly. Because you don’t have to carry cash, don’t have pockets many of them. Another favorite might be- quite a few of my ronin rants uh- the high school musical ones, the my little pony one, and the April Fool’s one I did of the Transformers movie, where I dressed up as a bad film maker extraordinaire tommy wiseau and went on this long 4minute ramble about the “inner meanings” of the Transformers movie and how it’s actually this work of great art. Would you say that self-advocacy is important, and why, and how? Self-advocacy like putting yourself out there, advertising yourself? Being up front with self-identification. I guess it’s all part of it. How would you define? Well it’s however you would define self-advocacy. Um I think you had a pretty good definition. Standing up for yourself, making sure that your needs are met, and basically saying yes i am a person I deserve the same rights. I think that’s omni important. Because well, if you don’t who will? You’re not always going to have someone there to wave your flag. And I think I the more you’re able to stand up for yourselves the better you’ll be able to help yourself in the long run. Mean if you’re if you’re standing up and someone standing up with you that’s more standing power to hold up the heavy load. Well Colin it’s been a real pleasure to have you here. Say hello to your dad for me by the way, he was a great teacher out at the AASCEND in san Francisco, and it was grea to meet him as well. And it’s great to see you and thank you so much for being a guest here at Exploring Different Brains. 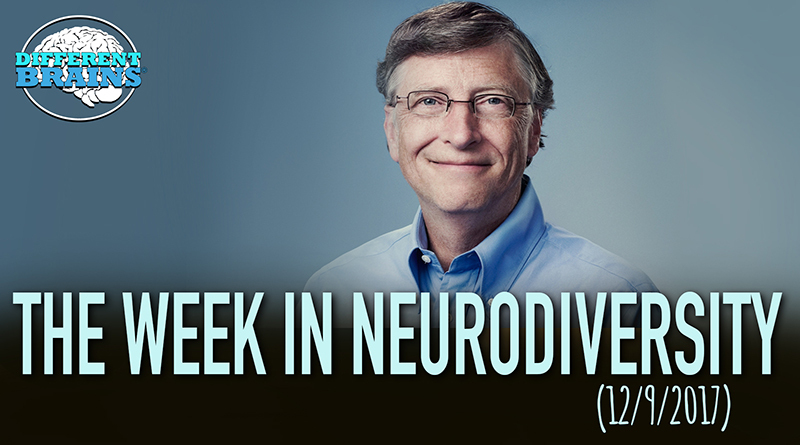 (3 mins 45 sec) In this episode, Bill Gates offers $50 million for Alzheimer’s research, BuzzFeed explores life with schizophrenia, and a young woman is the first with Down syndrome to enter a Miss USA State Pageant! These stories and more in this week’s edition! 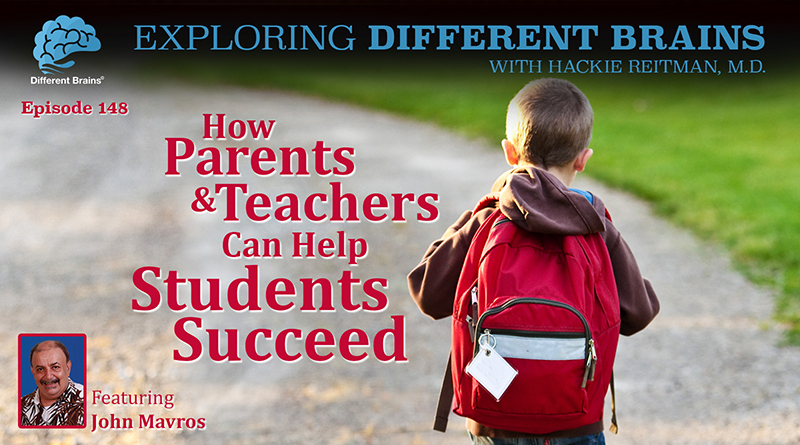 (22 minutes) In this episode, Dr. Hackie Reitman speaks with educator John Mavros, author of "Enough iz Enough", about how parents and teachers need to team up to help students succeed.